Eventmasters are delighted to offer official KIA Oval hospitality packages as England face South Africa in the 2019 Cricket World Cup. The last time these two teams met was in August 2017, which resulted in victory for the England side. England won by an impressive 177 runs with striker Joe Root left immensely pleased at how the game fared. Now, in 2019 as the two teams compete once again, the famous KIA Oval atmosphere will be thrilling as always. You can be there to experience it all with the very best in corporate hospitality. Enjoy all of the action in luxurious style, perfect for entertaining your valued clients and guests. Enjoy an unrivalled Cricket World Cup hospitality experience from inside the impeccable Corinthian Roof Terrace. 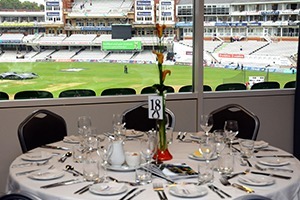 Sitting at the very top of the distinctive OCS Stand, this splendid corporate setting is perfectly suited to groups wishing to enjoy a relaxing day at one of cricket’s most renowned venues – the KIA Oval. With fine food, wonderful views and the very best hospitality service to indulge in, this hospitality package is certainly a must for any cricket enthusiast. The Montpelier Club, located in the Pavilion End, is the pinnacle of hospitality at the KIA Oval. Enjoy personal, attentive service along with delicious food and drink in the plush Montpelier Club. Located directly next to the players dressing rooms, it enjoys wonderful views of the thrilling cricketing action. Each guest will be allocated a luxury seat on the Montpelier Balcony, immediately in front of the classic bar and restaurant facility. Savour a fabulous day at the KIA Oval with our official Bedser Box hospitality package. Ideally situated in the Bedser Stand, these luxuriant executive boxes provide breathtaking pitch views from a dedicated private balcony outdoor seating area. This, coupled with delicious food and hospitality service, make the Bedser Box package an attractive hospitality package, perfectly suited to entertaining valued clientele. *Please note there is not always one seat per guest available at all times. Our OCS Boxes seat 24 guests and offer dedicated outdoor terrace seating on the 3rd floor. Unrivalled views of the pitch ensure that this is undoubtedly the very best facility available for entertaining valued clients and friends. The ground is situated on the A202, near the junction with the A3 and A24, just south of Vauxhall Bridge and 10 minues from Victoria and Waterloo. No match day car parking is available at or in the vicinity of the ground and we advise all customers to use public transport. We only offer parking to Blue Badge holders, which is situated off site on Major Match Days. However, this is very limited and is distributed on a first come first served basis. Take South West Trains to Vauxhall station which is a ten minute walk from the ground. The station is well served by trains throughout Surrey and Hampshire as well as from the Greater London area. Take the Northern Line to the Oval tube station. The main entrance to the ground is 100 metres on your left on leaving the station. The ground is also a ten minute walk from Vauxhall tube station which is on the Victoria line. Available for 24 guests and with a viewing terrace to see all the action – OCS Stand Boxes are some of the most popular hospitality packages at the KIA Oval. My clients were very happy with the hospitality and cricket. Well worth the investment. We really enjoyed our day at the cricket. The hospitality was superb and the views of the action were unbelievable. We have a dedicated page where you can view, download and print all of our event information for England’s International Cricket fixtures at the Kia Oval.